Our current selection of scales for rent are listed below and for additional product information or to schedule a rental, please call (630) 766-0120. Every scale rental provides you with credit towards the purchase of the scale you are renting; this means you can rent any scale for a low price and then apply some of that cost towards the purchase price. Save even more with reduced rates for long-term scale rentals! Simply contact us for additional information and a rental quote. Are you a business located within Illinois? Grant Scale Company is located near Chicago in the Northwest suburbs. 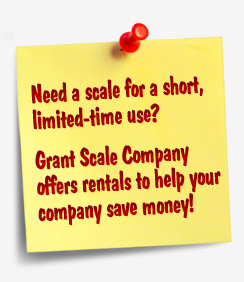 Click here to see why Grant Scale is the best choice for affordable scale rentals in Illinois. 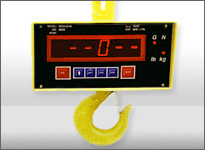 Need a scale for a one-time project? 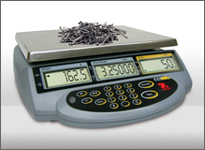 Performing an annual parts inventory and don't want to invest in a brand new counting scale? 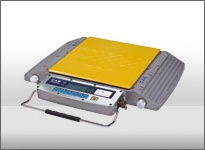 Whatever your weigh application needs are, Grant Scale Company offers high-quality scales for rent that will help you and your company save money with both short-term and long-term scale rental options! Better yet, all scale rentals earn credit towards the purchase of that very same scale; if you find the scale fits your needs perfectly and you want to keep it, you'll get a great value. All rentals automatically qualify for this rent-to-own option, which can be used as a trial in case you would like to see how well one of our scale models works. 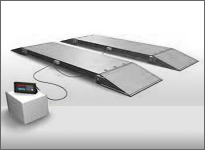 Below you will find all of the scale products available for rent at Grant Scale Company and because we rent all of our scales nationwide, you can save money by having a scale delivered directly to you via UPS or freight carrier. 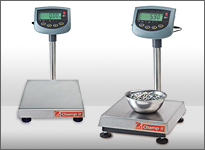 For additional product information or to discuss which scale type best fits your weighing needs, just call us at (630) 766-0120 during normal business hours. You may also email us anytime with questions or submit a custom quote request on a long-term scale rental. NOTE: For Illinois scale rentals, please click here to see how our proximity to Chicago's O'Hare Airport benefits the many small businesses and large corporations located throughout the Chicago land area. 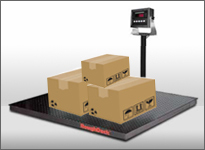 Need a scale delivered and set up within just a few hours? 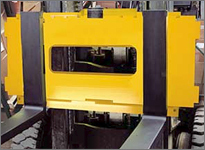 We can make that happen thanks to our consistent rental inventory and highly-skilled scale technicians.